Dr. Shilpi Bhadani brings more than 7 years of experience in plastic and reconstructive surgeries. 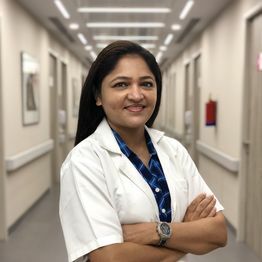 She completed her MBBS from SCB Medical College, Cuttack, MS in General Surgery from Institute of Medical Sciences, Banaras Hindu University, Varanasi and M.Ch. in Plastic Surgery from Vardhman Mahavir Medical College & Safdarjung Hospital, New Delhi. She has previously worked with GNH Hospital, Medanta, Safdarjung Hospital and Sanjay Gandhi Post Graduate Institute of Medical Sciences. She also worked at the Dutch Association of Facial, Plastic & Reconstructive Surgeons (DAFPRS), Laclinic, Montreux, Switzerland. Her areas of expertise include cosmetic surgeries such as Liposuction, Mommy makeovers, Abdominoplasty (Tummy tuck) Breast Augmentation/lift & Reduction, Fat grafting, Arm Lift, Face Lift, Rhinoplasty, Blepharoplasty, Chin Augumentation, Body lifts, Chemical Peels and Anti-ageing procedures. She has published national and international papers during her academic career and continues to pursue her research interests. She has a keen interest in facial aesthetics by non-invasive method like anti-wrinkle injections, derma fillers and lasers.